Last weekend I competed in the CrossFit Football Occupy Strength competition at CrossFit One World. The competition is one day long and consisted of two workouts: the CrossFit Football Total, and a short metcon. The emphasis of the competition is strength. Unfortunately for me I was in the same weight class as a 154lb chick. So being the smallest person in the competition, I knew from the beginning I was going to get crushed. Whatever, it was all about doing the best I can, and hopefully set some new personal records. Lucky for me, I PRed all the lifts in the CrossFit Football Total, and surprisingly did not come in last! In addition, my metcon performance blew Freddy's mind so I got the Pound for Pound award! yea yea, an unexpected pleasant surprise. Each power athlete will have three attempts to achieve a single max effort for each lift. The Total must be done in the order listed above. The sum of all three lifts will be your score for the CrossFit Football Total. All lifts will be preformed raw. Only shoes, wraps and belts will be allowed. We all PRed our lifts!! I really like the order the lifts had to be performed in. It really gives you the chance to hit a personal best for each lift. This event ran very smoothly and there was ample time and equipment to warm up with. We were divided into groups of five, with people of similar height and matching pin height for the back squat. The squad had 20 minutes to get their attempts in for each lift. There was plenty of rest time and plenty of spotters available. 2. A day of PRs! 4. yea yea back squat PR! 7. So stoked for a PR in my nemisis lift! 8. Hillary successfully pulling 375#! So glad I got to watch this!! CRAZY!!! 9. My AWESOME lifting squad! 10. NorCal CrossFit post CF Football Total competitors photo. This WOD had a 12 minute time cap. The prowler pushes were nasty! I think the fastest time was 5 minutes flat! People kept telling me to scale but I chose not to and totally proved them wrong, hehe. Yea yea, power to the little people! 13. The hardest part of the workout. Award Ceremony. Congratulations to Mary Ann for placing 3rd in the female light weight division and to Hillary for finishing in first place in her division!!! 15. Mary Ann in 3d place and Jessica in 1st for the light weight female division! 16. Hillary in 1st place!!!!! 17. I got the Pound for Pound award! 18. Glad to prove Freddy wrong! Awesome job to everyone who competed! It was a TON of fun and I know there was a lot of PRs! A huge thank you to the volunteers and Freddy for hosting the event at his gym! One World is a really sweet gym. The event ran so smoothly, probably the best run CrossFit competition I've attended to date! Everyone knew what was going on, it was safe, no equipment shortage, ladies bars(! ), bathrooms stayed clean, there was ventilation, and there was plenty of time for everyone to get their attempts in and warm up properly. It was also great to meet the CrossFit Football guys, a really sweet group of chill people. 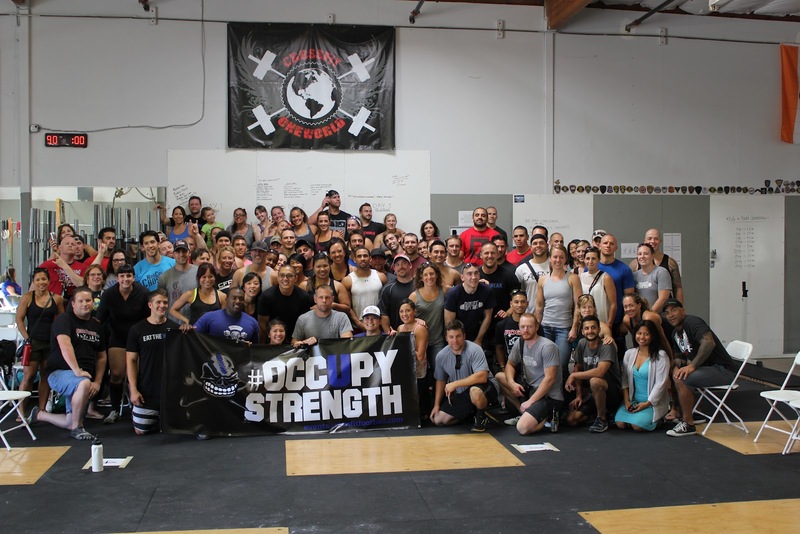 The #OccupyStrength competition is nationwide. So if they are coming to your city, I highly recommend signing up.. and signing up EARLY! !